This difficult biome is composed of sand dunes, sandstone, and deadly cacti. Occasionally, sugar cane grows on its edges. No passive mobs spawn here. The only benefits of this biome are its desert temples, desert village, and desert wells. The Desert biome is almost impossible to survive if your game starts there. This variation has a small oasis of water, allowing sugar cane to grow. This rainless biome offers flat, tall grass with arcadia trees, sheep, cows, and villages Like the plains biome, this is the only other place to naturally find horses. 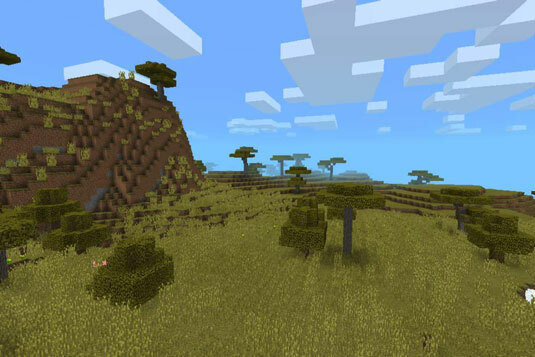 Mountains reach above the clouds to the highest level their world allows in the game (without using an amplified world type, which you can set before starting Minecraft in order to manipulate the size of mountains). Plenty of tall arcadia trees and tall grass and breathtaking peaks adorn its surface. This extremely rare biome offers red sand, hardened clay, red sandstone, occasional cacti, and six colors of stained clay. 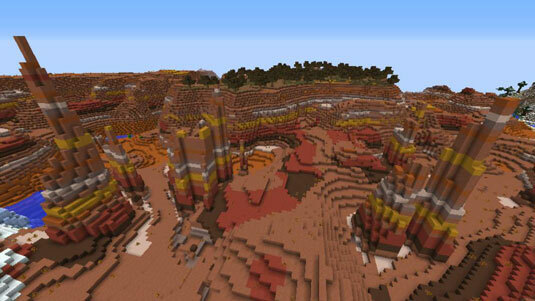 Small pools of water are found in all Mesa biome variations. This desert-like Mesa biome variation offers spire-hardened clay columns, similar to the hoodoos of Bryce Canyon in Utah (from which it draws its name). The figure shows what Mesa (Bryce) looks like. This biome is characterized by its flat-topped hills. In this case, the hills are the red hardened clay of the mesa. Mesa Plateau F has flat-topped hills but covered layer of dirt and grass with a few short trees growing on it (almost like a savanna). This variation offers steeper cliffs and longer flattops. This savanna variation offers tremendously high grassland, flattop mountains, often reaching the world height limit. More commonly called the Nether, this biome is created in the game; you don’t naturally spawn there. It contains rivers of lava, is surrounded by bedrock, and features large quantities of netherrack and nether quartz, as well as nether wart. This biome is the only home of blazes, wither skeletons, zombie pigmen, ghasts, and magma cubes. Glowstone and soul sand are also found here. Many nether resources are found in nether fortresses.